Coherent stock hit a 52-week low last month as trade concerns weighed on the business' outlook. 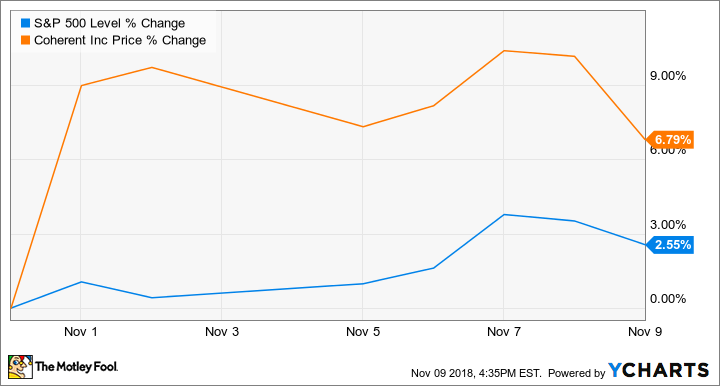 Shares of Coherent (NASDAQ:COHR) dipped 28.5% in October, according to data provided by S&P Global Market Intelligence. The laser company's stock sold off due to a slide in the broader market and concerns about the impact of trade tensions between the U.S. and China. 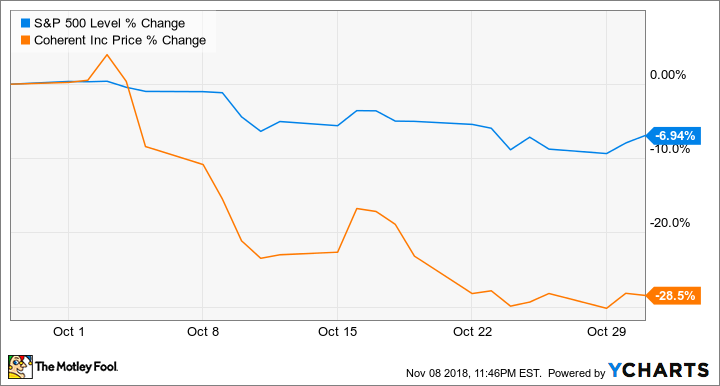 Coherent stock started tumbling on Oct. 5, after rival IPG Photonics reported disappointing guidance that it attributed to trade- and tariff-related factors. Shares have regained some ground in November, but are still down roughly 50% year to date. Coherent posted its third-quarter earnings results on Nov. 6, revealing that it, too, is seeing significant headwinds from the trade standoff between the U.S. and China. Earnings per share for the period came in at $3.22, declining roughly 13.5% year over year but topping the average analyst estimate for per-share earnings of $2.96. However, sales declined roughly 6% year over year to land at $461.5 million and fell short of analyst expectations by $1.5 million. Coherent stock has posted gains in November, trading up roughly 6.8% in the month so far thanks to an improved outlook for trade relations between the U.S. and China. President Trump made comments on Nov. 1 suggesting that there had been progress on trade talks with China and that a trade agreement between the two countries could be on the way. Coherent is guiding for sales to fall between 8% and 12% in its current fiscal year and plans to implement cost-cutting measures in order to offset the negative sales impact from the trade standoff.